How many people have a gigabit connection? Fewer than you think. As Google expands its commitment to bringing fiber-to-the-home gigabit connections to more places, I wondered exactly how many people actually have gigabit connections. So I asked Ookla, the company that operates the Speedtest.net service for its data. Turns out, there’s no real way to calculate who has a gig, but the numbers we do have indicate that not too many people are living in the future when it comes to connectivity. It turns out that between the first of this year and April 8 (when I got the data from Ookla) roughly one in 10,000 devices in the U.S. are surfing at gigabit speeds and roughly 1 in 5,000 homes worldwide can match them. Ookla runs the popular Speedtest.Net service and got this data from users who tested their connections during that time period. Unfortunately, the data on this is relatively inexact, because the art of measuring a gigabit is complicated. As late as last summer when Google launched the first plans for a fiber to the home buildout in Kansas City, the search giant had to work with Ookla to upgrade the test to even be able to read a gigabit. Even so, some customers with a gigabit might not show up because their Wi-Fi routers or computers can’t achieve those speeds and, thus, throttle them back to a mere 100 Mbps or so. And the numbers provided by Ookla actually measure customers with speeds of above 800 Mbps, which is what it classifies as a gigabit. In the U.S. only 4,110 people have test results at that speed out of 45,468,731 people who used the Ookla tests. Globally, 34,721 users have speeds that high out of 224,404,945 tests. But, clearly not every broadband user is running Speedtest.net or has the right equipment. Ookla also provides data on the number of people whose connection speeds are 300 Mbps or greater. In the U.S. this was about 51,100 devices or about 11 in every ten thousand users. Globally it was 204,315 devices or 9 in every 10,000 users. For additional data points, we can turn to the Fiber to the Home Council, which said a few weeks ago that 640,000 subscribers are buying connections of 100 Mbps or more across North America. That’s a significant number, although the FTTH Council is measuring capacity that is 10 times less than what a gigabit connection can offer. For reference, the FCC in February noted that the average U.S. subscribed broadband speed is now 15.6 Mbps, representing an average annualized speed increase of about 20 percent. 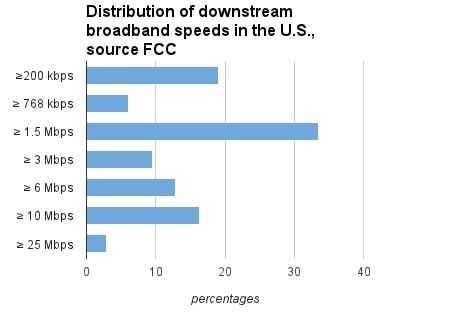 And below is a chart from FCC data at the end of 2011 showing the distribution of broadband speeds at the time. This chart measures both wireless and wireline speeds as of Dec. 2011. But it looks like the FTTH Council — as well as Google’s experience in getting 90 percent of the neighborhoods in Kansas City signed up for fiber — can tell us something definitive about gigabit connections: People want them. When fiber-to-the home is offered 44.8 percent of the homes passed take the service. Given that those are generally the most expensive connections, that’s a pretty high take rate. So it looks like even a few thousand Kansas City, Austin, Texas or Provo, Utah homes connected via Google Fiber will not only significantly change the percentage of gigabit customers in the U.S. but also around the globe. Still, we have to start somewhere. There are actually less than two dozen homes in Chattanooga with gigabit service. The figures I’ve seen show about two dozen businesses and one dozen homes. Not bad for a $390M network, huh? Good points both of you, although I think more than 50 Mbps might be useful for experiencing the web without a bit of a slowdown, especially for a family of active broadband users. As for the focus on downloads, sadly that’s where the FCC data has focused, although it’s getting better. We’ve covered upload speeds in the past, but we shouldn’t lose focus now. Stacey, I agree with you. I think 50 is borderline for a techy household. But it comes pretty close in 2013 to my mind. Stacey, perhaps you would consider doing a follow-on story about the percentage of U.S. homes that have symmetrical broadband service — a capability that would adequately support better quality video communications, as an example. IMHO, the focus merely on downlink speeds is myopic in the 21st Century. The point of Google’s Gig is not 1 billion bits per second. It is a network that allows subscribers to use the Internet however they want without the Internet slowing them down. That is the key. 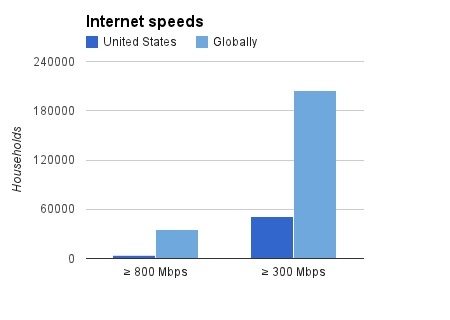 So by this metric, I would include the over 45,000 households to Chattanooga’s EPB Fiber network (where the slowest possible connection is 50Mbps symmetrical) as meeting that threshold. This is true of many FTTH networks generally but rarely true of cable or DSL because they so limit the upstream side. Has Google failed is most people get _only_ 700 or 800 Mbps symmetrical? Of course not. The point is to get away from being constrained by a few oligopolists and get on into the future.